Mysterious, wild and beautiful, Scotland in the 1920s is home to horrors modern and ancient, man-made and star-born. From the rolling pastoral Lowlands to the snow-capped peaks of the Highlands and the seaweed-choken Western Isles, creatures and cultures have taken root in Scotland whose maddening, corrupting influence can be felt far and wide. Fiendish things haunt the hive-like alleys and wynds of old Edinburgh, while Glasgow's streets whisper with rumours of dark terrors in the the shipyard shadows on the snaking, poisonous Clyde. And in the isles, murmurs on fishing boats and ferries speak of far older things, of sites of power and standing stones, awakenings and stirrings in forgotten places. 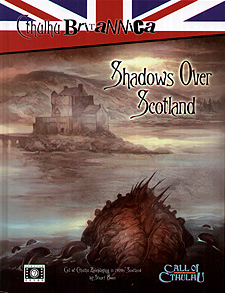 Something terrifying lurks in the night, casting dark shadows over Scotland.